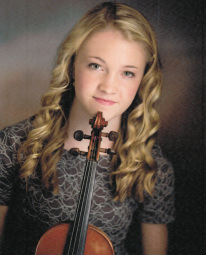 Margaret Ivory, 14, is a 4.0 student at Olympus Junior High School and a full scholarship student at the Gifted Music School. She currently studies violin with Eugene Watanabe. An accomplished violinist, she most recently soloed with the Utah Symphony conducted by Maestro Thierry Fischer on their Salute to Youth concert. She has also performed with the Oquirrh Mountain Symphony Orchestra, was the principal violinist of the Suzuki Youth Orchestra of the Americas, is a principal violinist of the Gifted Music School Orchestra, and was featured on KBYU’s Highway 89 program. She has performed in master classes for James Ehnes, Robert Lipsett and Andres Cardenes. Margaret’s past violin teachers were Deborah Moench and Ramona Stirling. A resident of Holladay, Maggie is the daughter of Frank and Rachael Ivory and enjoys travelling and tennis. She is scheduled to perform in New York City later this year at Weill Recital Hall at Carnegie Hall.